Spencer Savings Bank, a community bank headquartered in Elmwood Park, N.J., has re-elected three members to serve on its Board of Directors through January 2020. 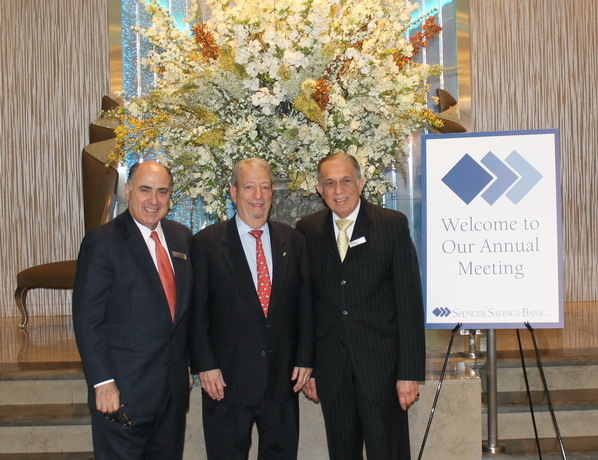 Anthony S. Cicatiello, Nicholas Lorusso and Barry C. Minkin were re-elected at the bank’s 2017 Annual Meeting held on January 19 in Garfield, N.J., reaffirming Spencer’s leadership and continued success. Anthony S. Cicatiello is the chairman of CN Communications International, Inc., a public relations and marketing communications firm. For three decades, he has brought diverse experience to the complex intersection of business, government and media. Mr. Cicatiello has counseled numerous Fortune 500 companies, institutions of higher education, municipalities, regional utilities and non-profit organizations. Nicholas Lorusso is the former president of Spencer Savings Bank, retired since 1996. He has sat on Spencer’s Board of Directors since 1984, including as Chairman, and continues to serve as a member of other board committees including the Executive Board of Banker’s Co-Op. He is also a member of Community Hope, a Parsippany, N.J.-based non-profit offering transitional housing and supportive services for veterans and their families. Barry C. Minkin has more than 30 years of corporate benefit and human resources experience with leading firms including New York Blue Shield, Pirelli Cable Corporation, SCM, Western Union and The Teare Group. He has served as a member of the Institute for Electrical and Electronic Engineers Inc., Employee Benefits Committee, Risk and Insurance Management Society of New Jersey, Council of Employee Benefits and Washington Business Group on Health Care.